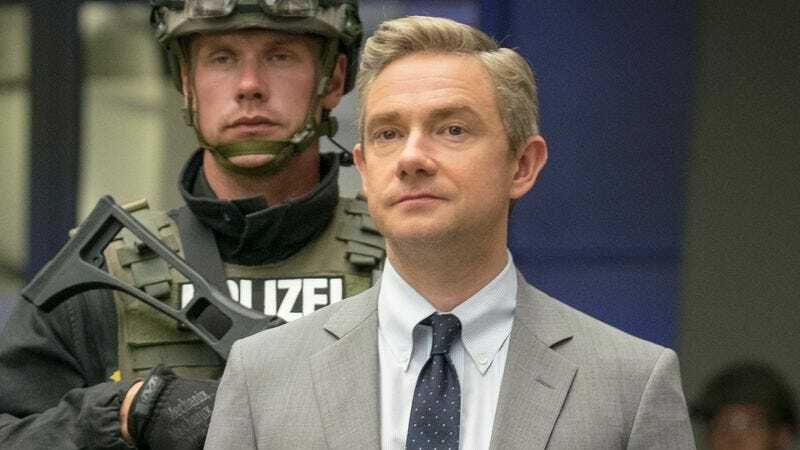 Martin Freeman made his Marvel Cinematic Universe debut in Captain America: Civil War as bureaucrat Everett Ross, a guy who really seemed to have it in for Bucky Barnes. Perhaps that’s what’s prompted him to journey to Wakanda (that is, Atlanta). Freeman was photographed on the set of Black Panther over the weekend, and since he was accompanied by an umbrella holder, we assume he wasn’t just there to gawk at lead cast members Chadwick Boseman, Michael B. Jordan, Danai Gurira, Lupita Nyong’o, and Forest Whitaker. Ross’ comics backstory has a much stronger connection to T’Challa. Not only did he serve as a diplomatic liaison to the prince, but he also dated someone who dated the Black Panther when he was in his Luke Charles guise. But even if he doesn’t find himself in that capacity, Ross could end up in Wakanda while on the trail of the Winter Soldier. Or maybe he’s just doing the Cabbage Patch in the background of Black Panther’s ’90s flashback.